Lightly spray a rimmed baking sheet with cooking spray. In a medium bowl, stir together the cilantro, scallions, water, fish sauce, sugar, and black pepper until the sugar is dissolved. Add the ground turkey and mix together thoroughly. Form the mixture into 20 meatballs (about 1 rounded tablespoon each). Place the meatballs on prepared baking sheet. Chill the meatballs in the refrigerator for 10-15 minutes. Remove the meatballs from the refrigerator and lightly spray the top of the meatballs with cooking spray. Bake meatballs in oven until they are cooked through, 15-20 minutes, turning half-way through. In a small bowl, stir together the lime juice, fish sauce, water, sugar, and chili garlic sauce until the sugar is dissolved. Set aside. Using a vegetable peeler, cut the carrots into long ribbons. Toss the carrots with 4 tablespoons of the fish sauce mixture. Reserve the remaining fish sauce mixture for serving on the side. 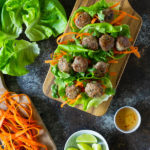 Serve meatballs with shredded carrots and fresh cilantro and basil leaves wrapped in the lettuce leaves. Spoon additional sauce onto the wraps, if desired. Moisten your hands slightly with water if the meat mixture sticks to your hands too much while forming the meatballs. I prefer to wear food-safe disposable gloves. It’s less messy and your hands stay cleaner.